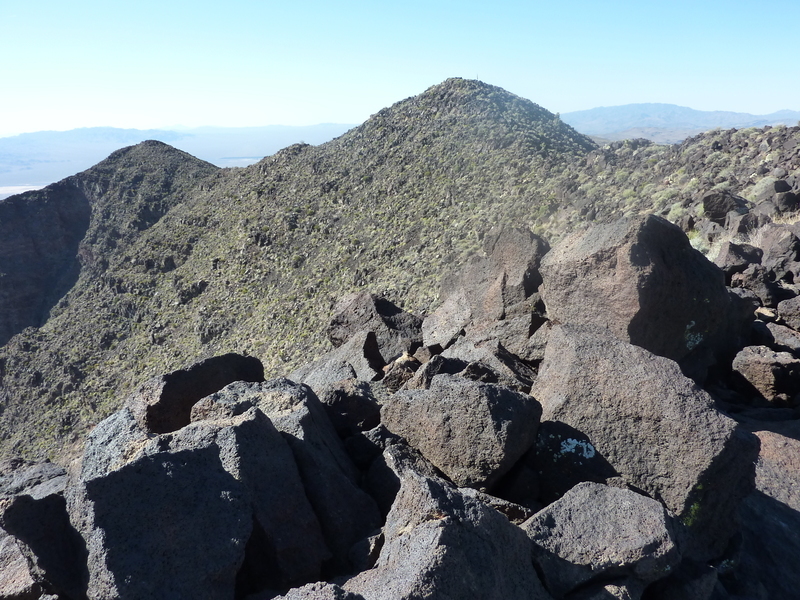 This P1K is located at the northeast end of the McCullough Range, found south of Las Vegas and Henderson. It has a 3.5mi trail all the way to the summit, starting from the edge of a newish development at the south end of Henderson, ample parking available. The trail is quite deluxe, well-signed and a godsend - it climbs up the West Ridge of Black Mtn, which is a heap of dark volcanic rock with somewhat tedious cross-country. The start of the Black Mtn Trail isn't obvious, as one first climbs the HC accessible concrete path to the top of a catch basin, then takes this minor trail around the west side to the back where the trail officially starts. Henry the Mountain Man on PB has left his mark all over the mountain, adding the lower north and south summits as well as other non-peaks (with zero prominence) along the trail and elsewhere in the range - someone needs to take away his computer. The summit features a benchmark, an american flag on a short pole and a huge rock windbreak. I kinda wanted to knock all the rocks down but it would have taken an hour and I'd probably have smashed my toes in the process. A large ammo box holds a ton of trash serving as a register. I didn't bother to sign in or even take anything out of the box. After visiting the south summit, I considered continuing south along the crest to the next actual peak, but this is where the cross-country looked most tedious. I sidehilled back along the west side of the highpoint to return to the trail, giving me a small taste of the cross-country. Bleah. There were five or six other parties on the trail during my visit - fairly popular considering it was a Monday morning. In addition to a few cute horned lizards, there were several rattlesnakes along the trail. One gentleman I came upon was tossing small rocks to get one to move out of the trail. Not sure why he didn't just walk around it, but I got a photo of it as it was moving into the brush. I was back around 10:30a, making for a three-hour effort. These two summits are located in the Spring Mtns, south of SR160 and northwest of Potosi Mtn. Access is via the well-graded, gravel Potosi Canyon Rd going up and over Potosi Pass. My starting point was at the start of a side road, closed to vehicles, that goes up towards the saddle between the two peaks. There is parking for a few cars here and the old road worked nicely as a trail to get me about 1/3 of the way up towards the saddle. Rather than climb to the saddle (which would have worked as well), I went up a line to the north that would more directly get me to Pas Rump. There are significant cliffs on the East Face of the long ridgeline, so one needs to choose a line carefully. Once on the crest, I found I had to go up and over a lower south summit before finding my way to the highpoint at the north summit five minutes further on, taking about an hour from the start. In contrast to Black Mtn, this one sees few visitors. It appears to have been named "Pa's Rump" by Hugh D Q (Harlan Stockman) in 2005, no doubt a play on the town of Pahrump. After a short break, I spent a second hour traversing the crest south to Bluebird Peak, about 9/10mi in that direction. This was the most enjoyable part of the day, slow-going in most places but it had some rather fun (and contrived) scrambling along the ridge with knife-edges and other completely avoidable obstacles. A fine breeze was blowing over the crest, keeping me cool, and I probably could have continued on for several more hours before tiring of it. Bluebird Peak had a register, too, also infrequently visited. For the descent, I went down the south side of Bluebird to a saddle (with its own lower, south summit) before dropping off the East Face. There was some spiciness in getting through the upper cliff band, but once that was negotiated it was pretty straightforward to make my way back down to the road. I intersected it near Potosi Spring where there is an historical marker for the Potosi Mine (about a mile up a side road) that produced lead, silver and zinc on and off from the 1850s until around 1930. There is a homestead just up the road that I went by, though it doesn't appear to be regularly occupied and looks rather dumpy. It was 3:30p by the time I finished up and called it a day.